While I appreciate the top-notch quality and personal chef attention at places like Shibucho, I can't afford - in time nor money - to enjoy that type of sushi all the time. Especially in these economic times. So I either have to scale back my sushi dining excursions to, say, twice a month, or I can seek out more affordable kaiten sushi, or conveyor belt sushi. Conveyor-belt sushi is authentically Japanese, the brainchild of a restaurateur who reportedly didn't have the staff to keep up a regular sushi place. If Wikipedia is correct, Mr. Yoshiaki Shiraishi opened his first kaiten sushi restaurant in Osaka in 1958. Gotta love the ingenuity of my peeps. Many kaiten places also offer up non-sushi dishes on the conveyor belt: sashimi, edamame, salads, cooked dishes and condiments and desserts (like the extra sauces and the sweet-bean rice cake pictured in photo). The quality of fish at kaiten sushi can be pretty good, especially if you go to a crowded, popular place where patrons are gobbling the sushi up so quickly that fresh plates keep coming out. 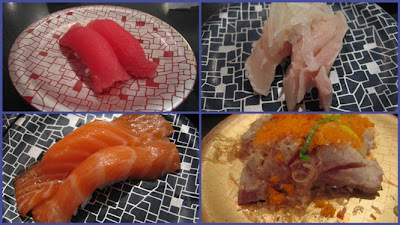 A really good kaiten place will have very good cuts of fish - you may just get smaller pieces of it. Like any other type of eatery, the quality depends on the owner and how good his fish sources are. So once again, I'd typically recommend only kaiten places that are run by Japanese. I haven't been to kaiten sushi here in the States since. But thanks (again) to Yelp, I just learned about Kaisen Kaiten Sushi Bar in Santa Ana, just down the street from my parents' home. How did I not know about this place earlier? I had to check it out. I called my friend Sam to join me for lunch. Kaisen is a fairly small place almost hidden in a shopping center (naturally!) near South Coast Plaza. The place was packed when Sam and I walked in at high noon, mid-week. The conveyor belt runs through the center of the restaurant and you can sit at the counter on one side of the belt, or at tables on the other side. Here's how it works at Kaisen: You grab whatever dishes you like from the conveyor belt, but you can also order specific sushi, sashimi or dishes by filling out an order form, writing your table number on it and sticking the form in one of the empty cups also circulating on the conveyor belt. The chef fills your order and sends your dish back on the conveyor belt with your table number prominently displayed. The price of the dish is identified by the color of the plate it comes on; like dim sum, your bill is calculated by the number of different colored plates you consumed. At the kaiten place I went to in Japan, which was a pretty large restaurant, you made special requests by pushing an intercom button at your table and verbally placing your order. We didn't special-request much, since there was so much variety coming across on the belt already. Kaisen is smaller, and the offerings on the belt are pretty basic and mass appeal (lots of plates of edamame, for instance). Sam and I quickly pulled plates of nice-looking maguro, albacore and salmon nigiri off the belt (pictured in earlier photo), and later filled out the forms for some temaki and sashimi plates. 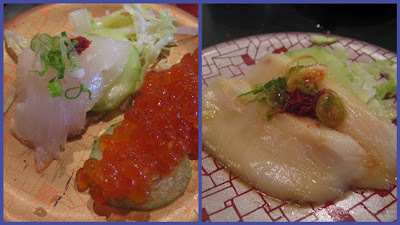 at right, white tuna topped with a very light ponzu (citrus soy sauce) and a big glob of what tasted like plum mixed with red chili. These bites were all surprisingly good, with nice cuts of good-quality, fresh-tasting fish. Temaki: The lobster roll, at left, and the negi toro (fatty tuna with scallions) roll. Both of these hand rolls were specials that day, each only $1.75! Great deal, and the ingredients were pretty fresh-tasting. 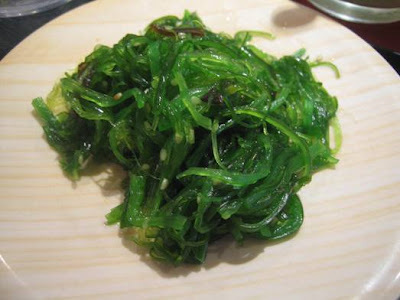 Seaweed-sesame salad: I really enjoyed this refreshing starter, lightly flavored with rice vinegar. Sam and I each gobbled up 8-10 dishes; the bill came to $38. The prices ranged from 99 cents (for my seaweed salad) to $3.50 (for the sashimi). It was definitely satisfying, and all my choices were simple, and very good in quality. I stayed away from the amaebi (sweet shrimp) and mackerel offered up at Kaisen; the sweet shrimp looked old and discolored (not good!) and I also didn't trust the quality of the mackerel. In general, kaiten sushi bars aren't the place to enjoy the more rare, higher grades of fish. I'd recommend sticking to the simpler cuts of fish that are visibly good quality. 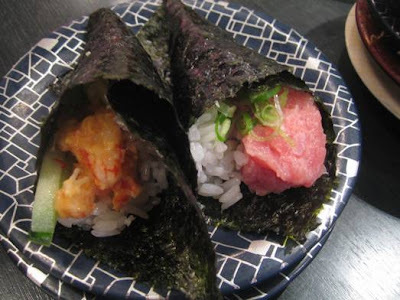 *Re: earlier mention of cut rolls: The cut rolls that are traditional Japanese are those that consist of one ingredient - typically raw tuna or a vegetable like cucumber or pickled radish - wrapped in rice and nori seaweed. And the cut roll is typically served in four to six perfectly bite-size pieces. Took my coworkers here after reading your blog. We all loved it, great sushi and good daily specials. Will def come back for more! Kaiten sushi ... in Beverly Hills? Shibucho: Love the "Sushi Nazi"